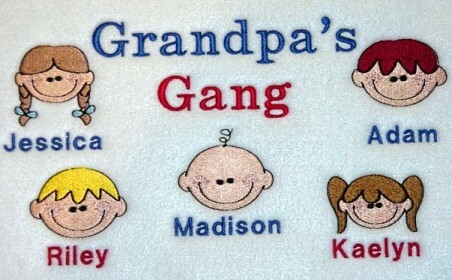 I will sew this really neat Grandpa's Gang design on the front chest. The design as shown measures 10" x 5 1/2". You may change the wording on the shirt to whatever you like at no extra charge, such as Papa's, Pop. 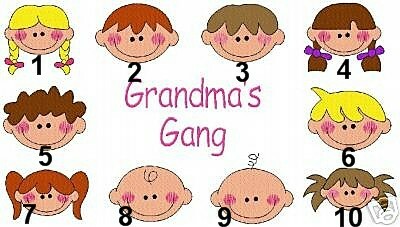 You choose what children's faces you want me to sew and you supply me the names, hair, and skin colors. There is NOT an option for eye color. They are black as is the outline of the faces. For skin tones, please choose from the examples below. Please remember that these are not portraits. If that's what you are expecting then do not order. 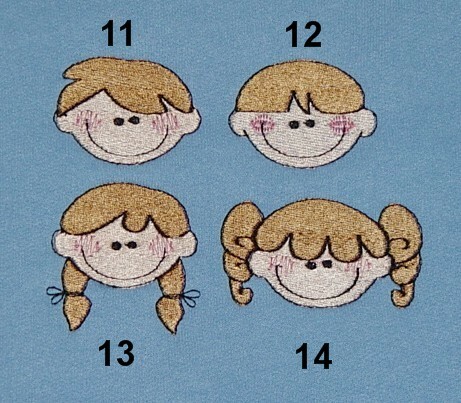 On the hair colors, it's light brown, medium brown, dark brown, black, red, blonde, or auburn. There is no thread color for "reddish blonde". I cannot perfectly match hair colors site unseen. The photo in this listing has all of the faces with numbers for you to choose from. The price includes up to 4 faces/names. Each additional face/name is $4.00. THE MAX # OF FACES IS 10. If you are wanting glasses on the faces, email me first for pricing please. Embroidery designs by Martha on Etsy.